Defense+ allows you to lock-down files and folders by completely denying all access rights to them from other processes or users - effectively cutting it off from the rest of your system. If the file you block is an executable, then neither you nor anything else is able to run that program. 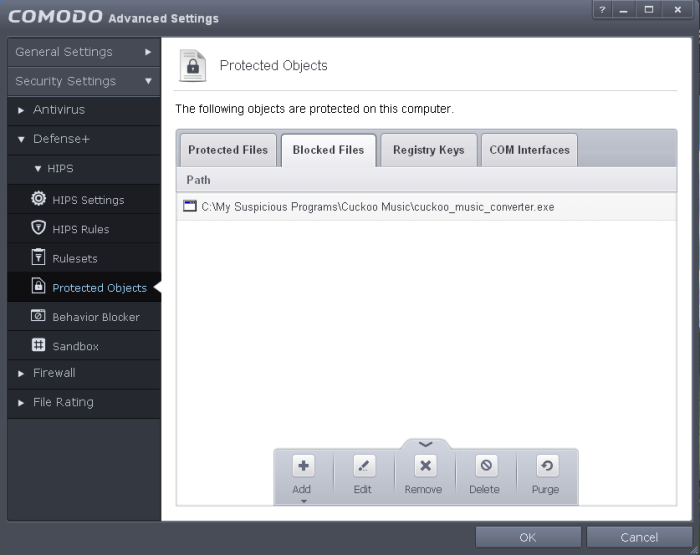 Unlike files that are placed in 'Protected Files', users cannot selectively allow any process access to a blocked file. Add – Allows you to add individual files, programs, applications to Blocked Files. Edit – Allows you to edit the path of the file. Remove - Releases the currently highlighted file from the blocked files list. Delete - Deletes the highlighted file from your computer. The selected item will be removed from the Blocked Files list. CIS will not block the application or file from execution or opening then onwards. Select the item from the list, click the up arrow from the bottom and select 'Delete'. The selected item will be deleted from your computer immediately. Warning: Deleting a file from from the Blocked Files interface permanently deletes the file from your system, rendering it inaccessible in future and it cannot be undone. Ensure that you have selected the correct file to be deleted before clicking 'Delete'.